The Flatiron Hex tells the story of Wylie walker, a contract shaman who works for nyorg, a city in the middle of a swamp. a city that may have been new york. wylie uses his unusual talents to crack codes and do routine maintenance on the city's interweb bio-technology. due to the haunted land and sentient mainframes, Wylie faces many occult adversaries. storms constantly threaten to destroy nyorg, but a secret feature of the flatiron building keeps the storms at bay, that is as long as the correct ritual procedure is followed. inspired by speculative fiction and neo-noir, the flatiron hex is a peek inside a parallel world infected with intelligent viruses and paranoia. the psychedelic and the mundane collide to evoke a magical reality. It's also a quest, a fast-paced comedy of redemption and sacrifice. The Flatiron Hex is a sponsored project of Fractured Atlas, a non-profit arts service organization. We must raise $40,000 by August 15, 2017. We might all rest easier if massive weather events could be "hacked"
unnatural disasters to manipulate the public. The Flatiron Hex, the Apocalypse (aka “The Storm”) is not without its fun. an annual event in NYORG, but provides it with an irresistible infusion of technology and hocus pocus. 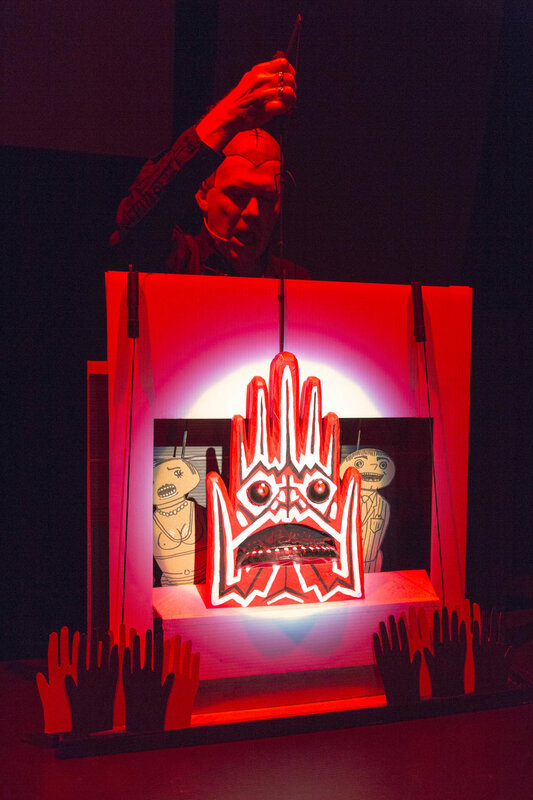 “CONTRACT SORCERER” That’s the job held by the 13-inch-tall hero of the psychotronic puppet play “The Flatiron Hex” at Dixon Place. And it well describes the show’s co-writer and performer James Godwin, a Thomas Pynchon with papier-mâché. )has been making music, directing theater, and performing for 25 years. He is a founding member of the performance orchestra Coocoohandler, presenting shows at venues including Webster Hall, Performance Space 122, MoMA PS1 and more. He was co-creator and keyboardist in the popular downtown show UncleJimmy’s Dirty Basement as seen at Joe’s Pub, the Bowery Ballroom, and the Toyota Comedy Festival. Tom has presented solo work as a performer/writer at the Manhattan Class Company, Nuyorican Poets Café, St.Mark’s Poetry Project in New York, as well as venues in Chicago, San Francisco, and Seattle. The Chicago Tribune dubbed his performance as “Walter Winchell on Speed” and the New York Times said that “Mr. Burnett is surely one performer who can, literally and figuratively, talk up a storm.” He was a featured performer in the National Cultural Alliance’s campaign to promote the arts in America, along with saxophonist Pharoah Sanders and the Guggenheim Museum. As a director, he has often been a collaborator on multimedia performance events for "Projects for a NewMillennium". His credits also include co-director of Danny Mydlack’s Mr. Big company; director of plays by Winchester Chimes, with the Formica Cornice Theatre Company; and original works at The Kitchen. Tom presented “Square’s Rhomboidal Dream” at Dixon Place. fled to NYC after one too many Rodgers Hammerstein musicals in his hometown of Richmond, Va. As Resident Lighting Designer at Dance Theater Workshop (DTW), he designed lights for 100’s of dance pieces and developed the Dance and Technology initiative. He has toured the world with the Phoenix Theatre Ensemble, Big Dance Theater, H.T. Chen, Chris Aiken, Karl Anderson, Dan Safer, Fiona Marcotty, Nami Yamamoto, Jeanine Durning, Sally Silvers, American Spanish Dance Theater, John Jaspers, The Bang Group, The Elementals and many others. 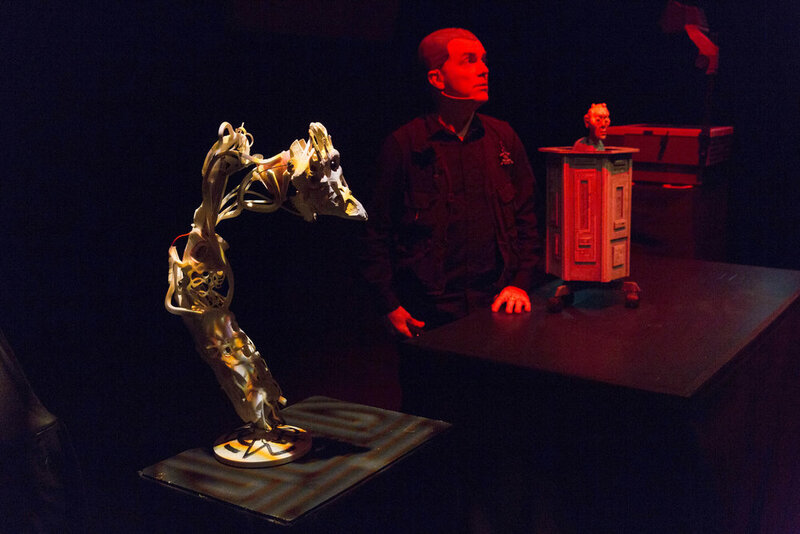 Jay was Nominated for a New York Innovative Theater Award for his lighting of ‘Dancing Vs the Rat Experiment’ with WRC and was Awarded the Eva Adamson award for Excellence in Lighting Design in 2011.
is a super - villainess/puppeteer, puppet builder, designer, director, techformer, writer and wrangler. An alumni of the UCONN Puppetry Arts Program and the National Puppetry Conference, she has toured the nationally and internationally working with Arias With A Twist, Butterfly Dreams,Night Shade, Uncle Jimmy's Dirty Basement, The Adventures of Charcoal Boy, Animal Farm: A Musical ,Between the Lions, Blue’s Room, The Chapelle Show, Bunraku, Addams Family: A New Musical, and many other projects. In 2008 she created Almost Clever Puppets with fellow puppeteer and puppet builder Heather Sehrt and can be seen performing her solo pieces at various late night variety shows around New York.
) 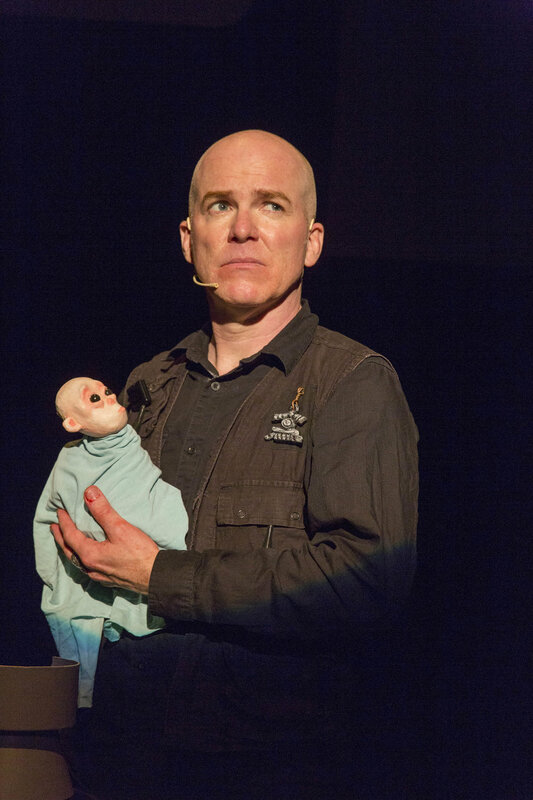 is a puppet artist, producer and Associate Artistic Director of the National Puppetry Conference. Prior to her work as the VP of Business Development Client Relations at Puppet Heap, she produced, built puppets, stage managed and puppeteered for productions at Carnegie Hall and the Cherry Lane Theater. 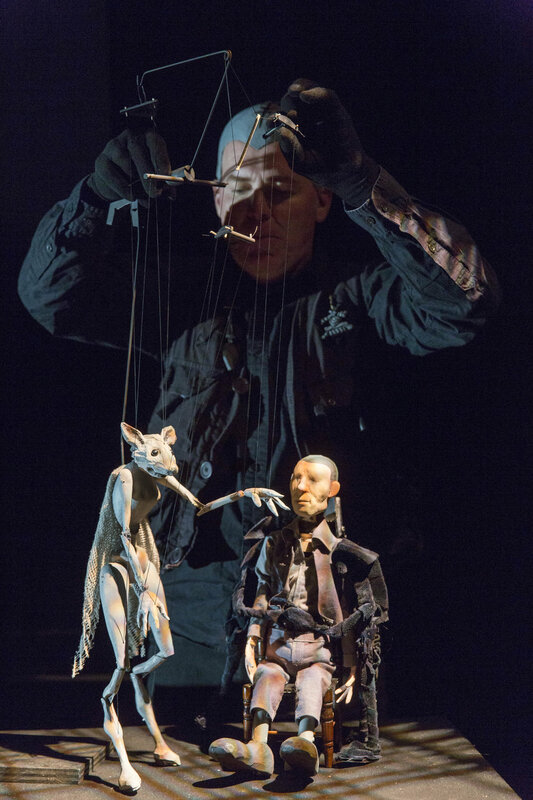 A graduate of the UConn Puppet Arts program and a two - time recipient of Jim Henson Foundation grants Jean Marie was the first puppet artist to perform at the prestigious Fusebox Festival in Austin, TX. Building credits include The Muppets, Baby Einstein, The Daily Show and Avenue Q to name a few. Currently, Jean Marie is proud to return to work with No Strings and continues to write and produce original works.